Most of us know Facebook marketing is working when more sales roll in or site traffic grows. But for Alex Morrissey of JamaicansMusic.com, that moment came when a party in Indonesia ran out of goats. 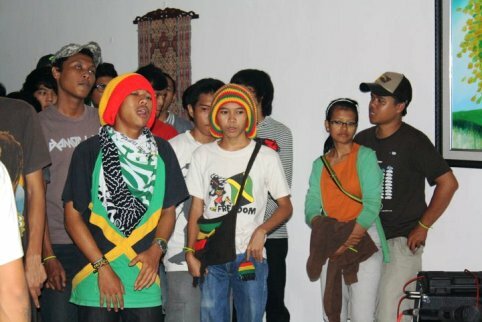 A JamaicansMusic.com launch party in Indonesia, where the most Facebook fans reside, drew 1000 people. But don’t let the goats fool you. Morrissey is as business-savvy as they come—even at 22. With a fast-growing music site started when he was in college, Morrissey is well on his way to becoming the Jamaican Mark Zuckerberg. Today, Morrissey is proof that doing what you love can lead to success. And he says he wouldn’t be where he is today without Facebook. The JamaicansMusic.com Facebook page now has more than 470,000 global fans—adding nearly 1,000 every day—making it what is thought to be the largest Facebook fan page of any in the Caribbean. More importantly, the business is bringing in an income and has grown Morrissey’s business to five employees. 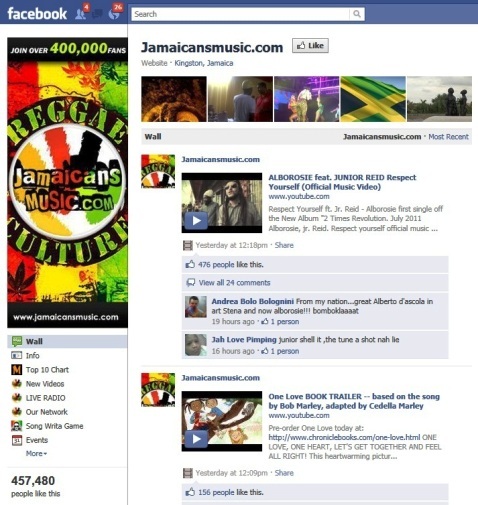 JamaicansMusic.com has used Facebook from early on to grow its fan base and revenue. The Facebook page draws about 150,000 unique visitors every month and nearly 1,000 new fans each day. Giveaways and live chat on Facebook for an album launch grew the fan base from 25,000 to 40,000 in just two weeks. Offering a free music download from a sponsor drove 5,000 new fans in a matter of hours. Morrissey started the website a couple of years ago as a college student at the Art Institute of Fort Lauderdale. He simply couldn’t find a good site dedicated to the reggae and dancehall music he enjoyed, so he created his own. 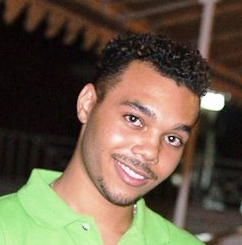 Alex Morrissey, now 22, started JamaicansMusic.com while still in college. But likeminded fans of those styles of music soon discovered JamaicansMusic.com. There, they can listen to relevant Internet radio stations, watch videos and learn about artists. As traffic has grown, Morrissey has improved the content and started promoting it heavily through Facebook. He moved back to Kingston, Jamaica and opened an office. Now a multimedia company, Jamaicansmusic.com hosts live events and recently started its own Internet radio station and magazine. Fans can access the company's Internet radio right from a Facebook tab. He owes the site’s momentum largely to the growing Facebook traffic. But Morrissey doesn’t just post on the site’s wall. He’s taken a few strategic steps that have made all the difference: rich content on Facebook, attractive giveaways and geographic targeting of promotions. JamaicansMusic.com brings people to the Facebook page with engaging and fresh content. First, the team posts several new items on the wall each day, usually music videos. The engaging posts typically generate hundreds of likes and multiple comments. Additionally, the site offers interest beyond the main wall with multiple content tabs for information such as a top 10 chart, new videos, the world’s biggest reggaefest and access to the company’s own Internet radio station, JADIO. 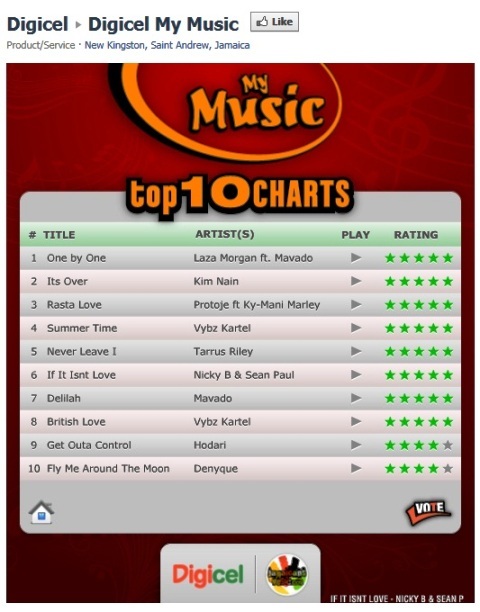 Fans can always find out what's hot on the Top 10 tab on JamaicansMusic.com's Facebook page. 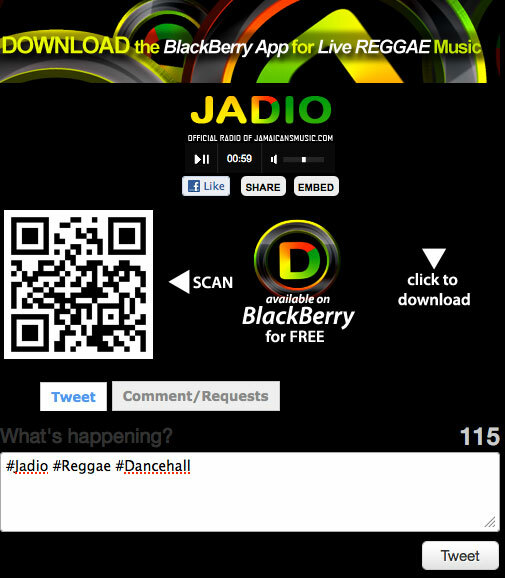 Fans can also play the popular game created by Jamaicansmusic.com, Song Writa, where they can mix their own music. 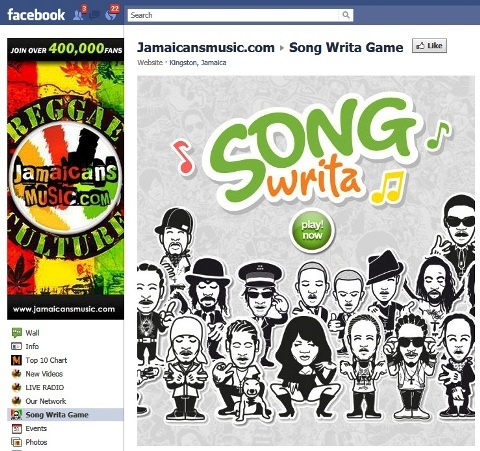 Created by JamaicansMusic.com, the Song Writa game lets fans make their own music. Idea #2: Give away free stuff! Like a savvy music industry pro, Morrissey teams with radio stations, record labels and companies at least once a week to run hot promotions that draw fans in flocks. Often that includes a relevant giveaway like concert tickets or free phones. As a result of those sponsorships, along with display advertising and commissions from iTunes.com, Morrissey has monetized both JamaicansMusic.com and the Facebook page. For the Song Writa game, JamaicansMusic.com launched the new offering with an event that took place December 15 on the Facebook fan page. 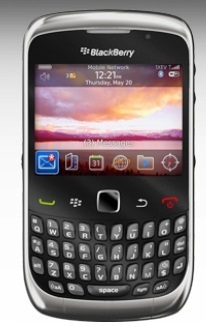 To increase attendance, the company offered BlackBerry Curve smartphones and a $5,000 (Jamaican) credit from mobile phone company Digicel. 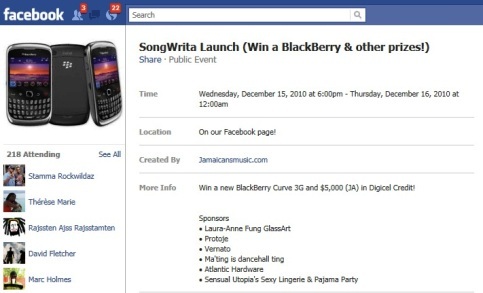 JamaicansMusic.com gave away Blackberry Curve phones to promote its new Song Writa game. Those incentives helped draw 218 attendees. But more importantly, the launch helped drive early Facebook traffic up by 7,000 new fans over the course of four weeks. At its peak, about 15,000 users were playing the new game. With Facebook, the growing startup saved major marketing dollars for its game launch. “We were able to reach a large number of people interested in this game without spending any additional money on traditional means like newspaper ads,” Morrissey said. Giveaways for the launch of the Song Writa game helped drive up the fan count by 7,000 and increase the number of gamers to 15,000. Anything related to legendary musician Bob Marley always draws the greatest number of fans. 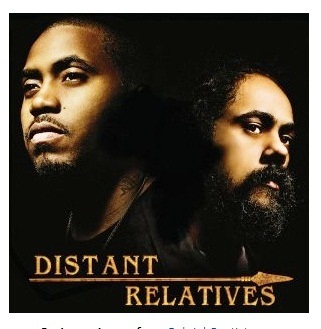 When Marley’s son Damian released an album last year, JamaicansMusic.com teamed up with him. A promotion with Damian Marley's new album brought in 15,000 new fans in two weeks. The site ran competitions and gave away autographed CDs, posters and tickets to the live shows. Fans simply had to like the page to be entered. JamaicansMusic.com also hosted a live chat on Facebook with the artist, letting fans ask questions. In just two weeks, the number of Facebook fans had jumped in response from 25,000 to 40,000. The most impressive increase in fans came from the release of Vybz Kartel’s new and highly anticipated album. JamaicansMusic.com was given an exclusive track that was made available to fans for free if they entered their names and email addresses. Remarkably, the promotion brought in 5,000 new fans in just a few hours. Morrissey credits his success in attracting sponsors and advertisers largely to the page’s ability to provide specific demographic data. With tools such as Facebook Insights, he knows the breakdown of fans by country, gender and age, and shares that with sponsors. In fact, JamaicansMusic.com fans come from more than 230 different countries. For example, Facebook Insights shows that, surprisingly, the greatest number of JamaicansMusic.com Facebook fans reside in Indonesia (more than 65,000). 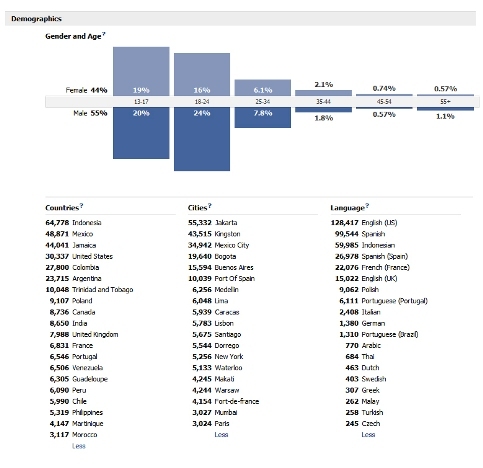 Facebook Insights shows the exact global breakdown of the company's Facebook fans. When meeting with advertisers, Morrissey shows them stats from Google Analytics and Facebook Insights. For advertisers like Samsung, Johnnie Walker and Digicel, Morrissey directs messages, wall posts and promotions only for certain segments of the Facebook audience. When he posts on the wall, he uses the pull-down tab underneath the status box and chooses “Customize.” There, he chooses to share with those only in specific countries. With geo-specific targeting, he can be relevant to a segment of fans without alienating others. The company keeps content relevant with wall posts targeted to fans in specific countries. 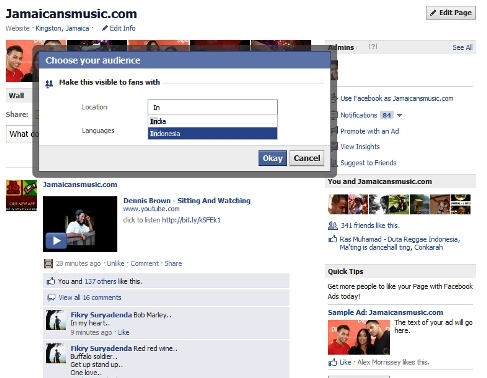 For the Damian Marley promotion, JamaicansMusic.com used Facebook geographic targeting to reach fans specifically in South America. As JamaicansMusic.com expands its offerings to a global audience, Morrissey anticipates that the site will get even more strategic in pursuing advertisers for country-specific promotions. “Our plan for the fan page is to find top companies in countries where there are lots of fans, and provide a proposal, saying, we have these fans, we can, if you become a sponsor, promote products and artists in your country, to get you exposure and help us as well,” he said. Analyze Facebook demographics and proactively target sponsors—Know who your audience is and then find partners. Identify freebies sponsors can offer—Bring in fans by the hundreds with giveaways. 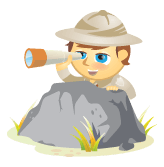 Woo potential sponsors with stats—Show them they can reach their audience. Target content to unique segments of your fan base—Bring relevant offers just to certain parts of your fan base without alienating other segments. What do you think? Have you tailored your content to your audience by geography or interest? Did it improve fan engagement? Leave your comments in the box below.